About Meckel I can find little information. There was an Arnold Meckel who lived in France and occasionally contributed to philatelic journals in the 1970s and this may have been Meckel's son. But it could have been the original Meckel. Google throws up a lot of information about an Arnold Meckel who was based in Paris in the 1920s and 1930s, but this Meckel was an Impressario with strong connections to Argentina. Maybe this Meckel provided the finance for Maison Romeko? Whatever the details, it is clear that Rockling was the driving force of Maison Romeko. He was born in Tiflis in the 1890s and left when the Bolsheviks arrived in 1921. He went to Constantinople and, according to several sources, was part of the Sredinsky - Rosselevich - group which produced dubious issues for the stamp trade: the Georgia Consular overprints, the Refugee Post stamps, the Levant "Ship" phantasies (which like the Refugee Post stamps appear to have been printed at the V M [ Y]essayan works). Like Sredinsky, Rockling moved to Paris and from the first letter shown above was already installed in the rue Bucharest in 1924. But whereas Sredinsky made his money from reprinting Refugee Post stamps in Paris, Rockling clearly set out to establish himself as a serious and reliable dealer. 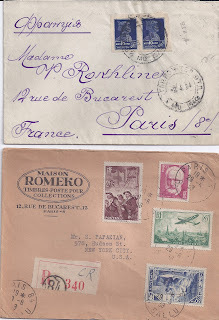 When sheets of stamps came into stock, he would often pencil in the corner of the sheet the word "Bon" with his initials - and his "Bon" is almost always correct. Likewise,his famous oval house mark "Maison Romeko Paris" is only rarely found on fakes - and then it seems to be a case of human error rather than intent to deceive. According to Dr Ceresa, Rockling was a major purchaser of Civil War period stamps when the Soviets cleared out their stocks in the 1930s. His purchases included early Soviet Armenia - and this may explain the second letter shown above, addressed to an Armenian in New York. 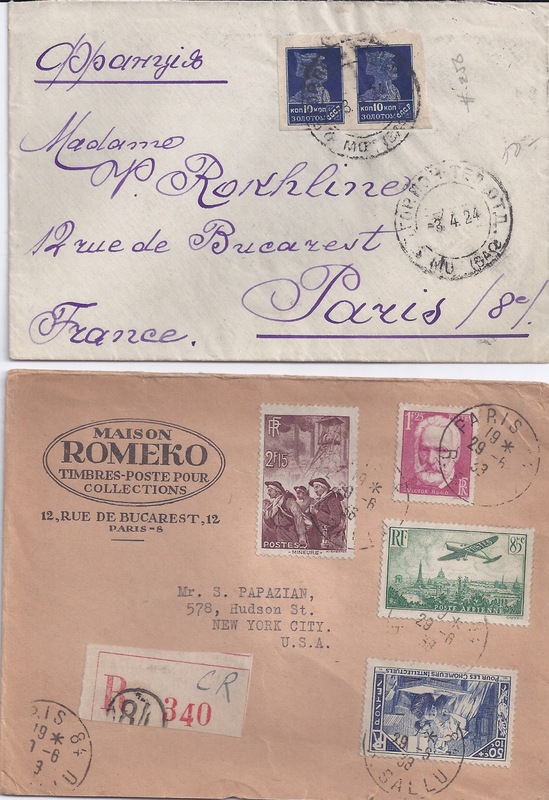 The printed address shows that the Romeko shop was still in the rue Bucharest. At some point, the Romeko shop moved to 41 rue des Martyrs in the 9th Arrondissement (the stamp District which includes the rue Drouot). It was there in 1962. I have a date of death of 1975 for Rockling.